Without the right ingredients in the correct proportion, any dish will not taste right! So, what are the ingredients to make any goal worthwhile? A few months ago, I decided to pick up running as a way to make myself fitter. On one fine evening, I put on my running shoes and set a target for myself – 10 laps of the athletic track in 20 minutes. Though I ran with all my energy, I could complete the task in 25 min. However, I was happy that I performed well. The result – I hurt my knee. New to running --> Set a target --> Focus was on performance and not on the form and technique --> Knee pain --> Motivation levels went down --> Self-efficacy went down --> Couldn’t run for many days. I am a young HR professional, not by age, but by experience. In this little experience, I have been lucky enough to learn a lot. I also believe that the HR concepts/theories that we have studied during our classes can be learnt well if we start to watch things/ people around us closely. My running experience was one such example which came to my mind when I began to write on performance goals vs learning goals for new recruits. A goal is a specific target which we want to achieve. 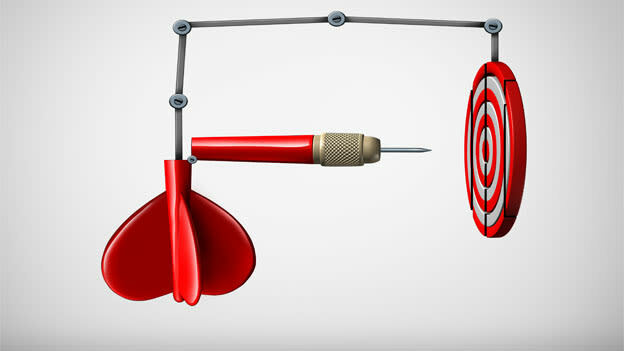 A goal should not be mistaken for a ‘desire,’ a mistake most of us commit. This has a very simple answer to it. Having goals leads to better performance. Period. What are the ingredients of having a goal? Without the right ingredients in the correct proportion, any dish will not taste right! So, what are the ingredients to make any goal worthwhile? Take a pause. Think about a goal which you set for yourself and really worked hard towards. Think backwards - of what it was that led you to put in your efforts. The reasons can vary, ranging from rewards, thrill, emotions etc. Is the goal important to me? Is it challenging? A performance goal is the destination, while the learning goal is the journey. A performance goal is the motivation, while the learning goal is the medium. A Performance goal is an outcome, while the learning goal is an ability. If I have to say it in one line – The essence of a learning goal is to hone one’s ability and knowledge. For a performance goal, it is to implement that knowledge. Both the goals are very important to keep the motivation up in any setting. For instance, ‘Attrition percentage to be reduced by 10% at the end of a FY’ is a performance goal. While, ‘Come up with three new strategies through which attrition can be reduced’ is a learning goal. As we are talking about the goal setting for new hires, let’s see what the presence and absence of learning goals can result in. In all the situations, let’s assume that the employee has the belief in his/ her ability (self-efficacy). 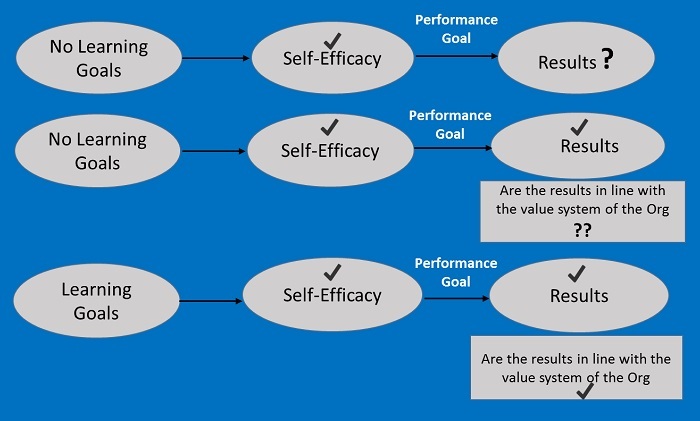 But are we sure that we will get the desired results with just self-efficacy? A learning goal increases the probability of an employee delivering on his/ her performance goals, with the results being in line with the organization’s value system, as depicted in scenario 3. There must be a good composition of learning and performance goals. A manager should take a wise call by understanding the current skill set of a new hire, as well as of a seasoned employee. While taking into account the skills on which the new hire is already trained on, the best option is to run him/her through the system of your organization. Post that, a performance goal can be set. A few other goals can be learning goals. A perfect blend of both the goals gives a new hire the confidence to take up new projects and also gives him/ her a satisfaction of achieving targets by utilizing one’s current and new knowledge. Through learning goals, you can make the new hire come up with new strategies and look at your current processes from an outsider’s perspective. It can be a great ‘outside-in’ approach, which can really help you better your processes/systems. And after all, I am sure we don’t want to hurt our knees.